Got the chops to be Bryant’s Playground Supervisor? Paid position available! New Playground Supervisor Needed: Paid Position! Do you have a few extra hours in the middle of your school day? Do you love being outside? If so, we’d like to hear from you! One of our current playground monitors (Spencer) is moving on, and we are looking for someone to replace him. Ideally, we hope to find someone who enjoys working with young children, has good people skills, and is looking for a part-time position in a school setting. As a key member of our staff, this person works with our teachers and one other playground supervisor to keep our students safe and well during our lunch and afternoon recesses. This PTSA funded position pays $13 hourly, with a daily time commitment between 10:30 and 1:30 pm. We are looking to hire someone as soon as possible, who will begin in early January. If interested, please contact Julie Pearson, Assistant Principal, or at 206-252-5200. 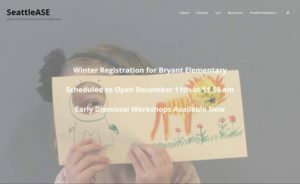 Registration for Winter after school classes opens soon at www.seattlease.org. You can view all of the class descriptions, register, and pay online. All in one place! Registration will open December 11th at 11:59 am and close December 24th. The Fall schedule runs from January 3rd to April 7th. Contact the ASE Coordinator for further information. Parents, we need cool stuff for our online auction! Questions? Ready to donate? Get in touch with us. Thank you!